At 10am on the 12th February 1554, Guildford Dudley was led out of the Tower of London and up onto Tower Hill where he was executed by beheading. Guildford’s wife, Lady Jane Grey, watched from her window as she waited for her turn. As she was led out of the Tower to be taken to the scaffold within the Tower walls, she was met by a cart carrying the bloody remains of her husband. How awful! Jane was then also executed by beheading. 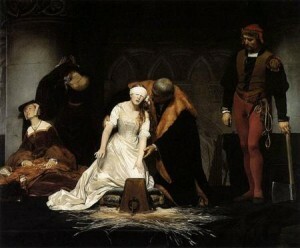 You can read the full details of this tragic day in my article “Lady Jane Grey’s Execution”. RIP Lady Jane Grey, or Queen Jane, and Guildford Dudley. How odd, I decided to watch Lady Jane Grey last night… Such a shame. I wonder how life would have been if she did remain Queen. I watched it tonight. The movie really showed how driven her mother and Guildford’s father were for their own agenda’s. As harsh as this sounds, I wish that Mary Tudor had never been made queen. How did England or their people benefit by her reign? I’m following Ellie’s example and watching Lady Jane on instant Netflix today. You kinda have to, right? Also, does it make me a freak for being more upset about Jane’s demise than Whitney Houston’s? No..I feel the same though I was surprised by Ms Houston’s death. I have always felt sorry for Lady Jane Grey, she was only a child when all happened. But the thing I remember the most is when she was a little girl who befriended Edward VI, some people even said she was in love with him. I would like to see them married but well sadly both died very young. This is not a nice wedding anniverary present for me. It’s bad enough my birthday is the date for the trial of Brereton, Weston, Norris and Smeaton. Poor Jane! She was like what 16 or 17 years old when she was executed and even though there is a major year difference between us she wasnt much younger than I am now. Poor girl was used by ambitious parents as well as in laws but at least in the end she truly knew that Mary was not a merciful princess. As anyone who read my entry into the Tudor characters competition, Lady Jane and Me, will know, Lady Jane Grey has held a special place in my heart for many years. I always try to think a kind thought about her (and say a little prayer for her) every year on February 12. I forgot to add that I also spend some time reflecting about what role Lady Jane would have played in history if she had lived. It drives me crazy that we’ll never know what she might have become.